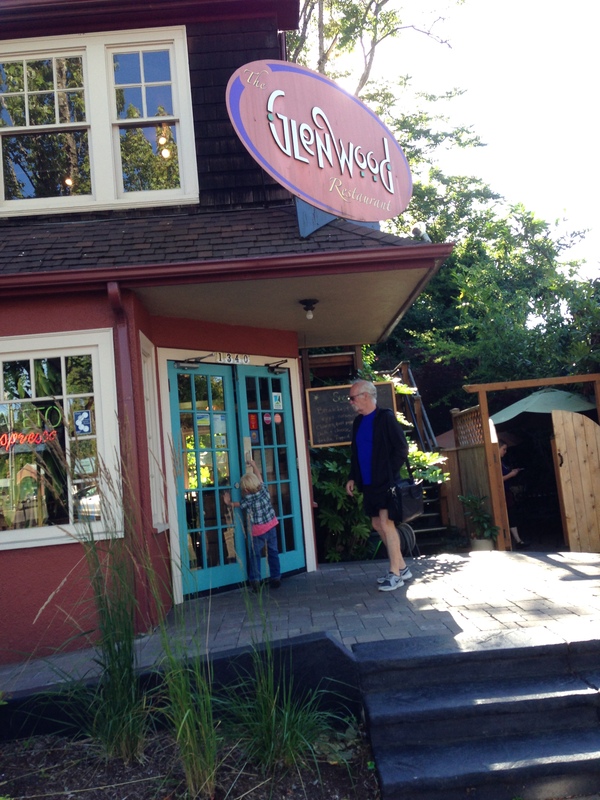 I have put off and put off writing about our days in Eugene, Oregon on our road trip; yet of all the new places we explored, Eugene may be my favorite. Many times since we’ve been home I have wondered how I might begin to capture how and why I fell so deeply in love with this quiet and friendly and mellow college town. Perhaps part of my attachment stems simply from how normally we lived there and did the usual family things: we made ourselves right at home, marketing, racing, celebrating the 4th of July, wandering to the Days Inn breakfast in our pajamas, chatting with the locals when we could, and wandering the University of Oregon with a sense of belonging as though it were our alma mater. 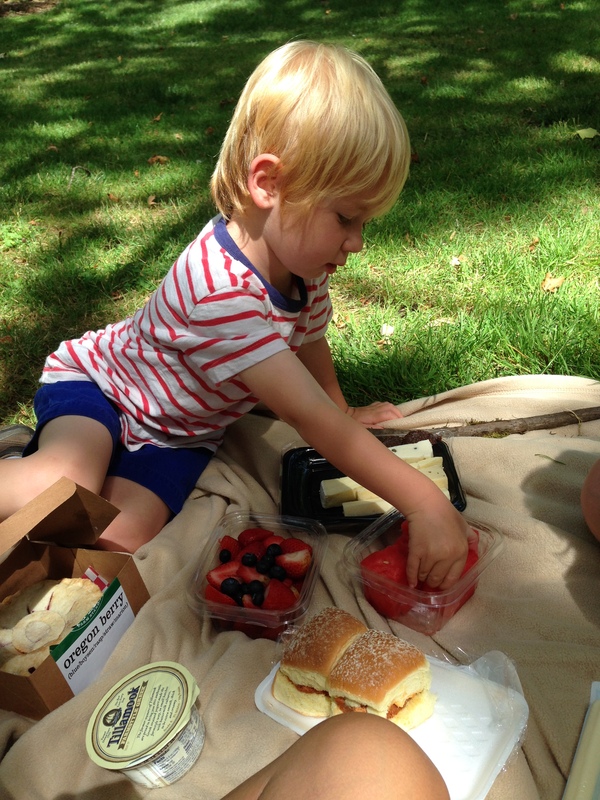 Last summer when we returned from Shipshewana, I felt homesick for it for months and felt ready to pack up my life and move there with my family in tow. This year, I am ready to move to Eugene. I am starting to become suspicious of myself, I must say! Maybe it’s just that we could be happy in so many places, and for that realization I am thankful. I am certainly in love with Temecula, too, my home. If only we could be everywhere at once, yes? Bill and I watched part of the IAAF World Junior Championships in Eugene this past week at Hayward Field. 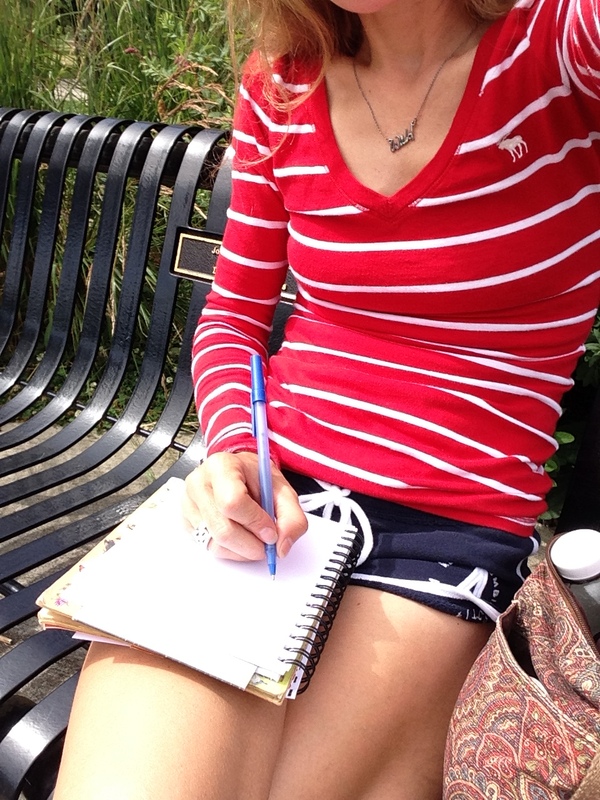 Periodically I saw shots of Alton Baker Park and other familiar places. 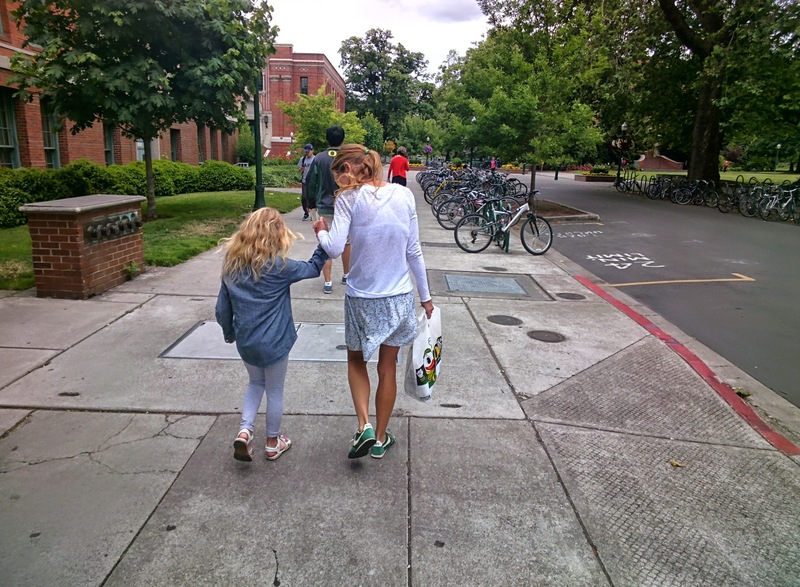 My heart longs… I miss everything about Eugene. We spent an overnight there on our way from Crater Lake to Portland. 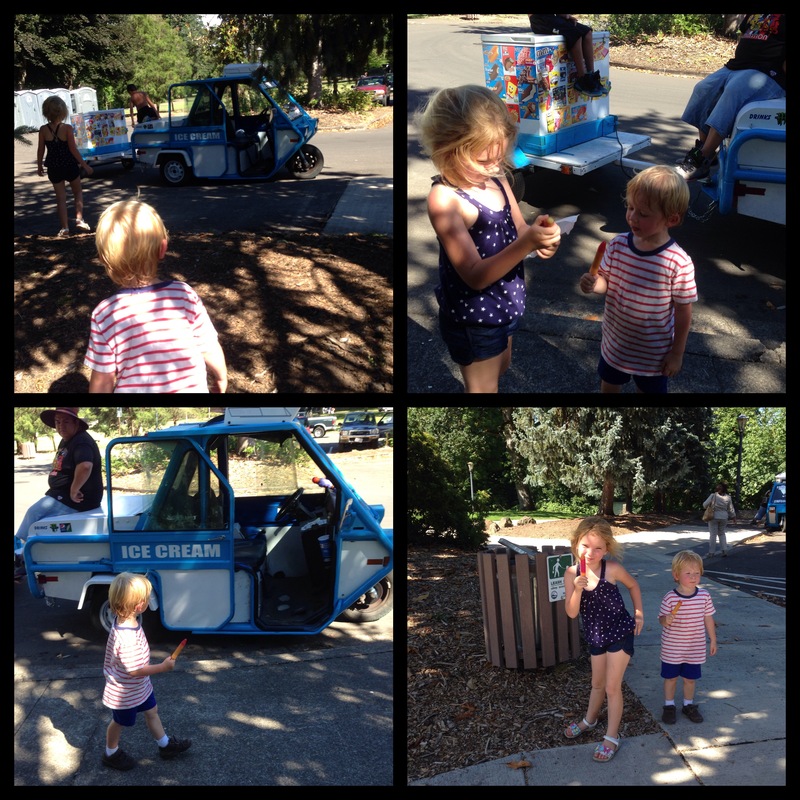 After a few days in Portland, we returned to Eugene on the evening of July 2nd and left on the 5th for the coast. On the first overnight, we rolled in fairly late. 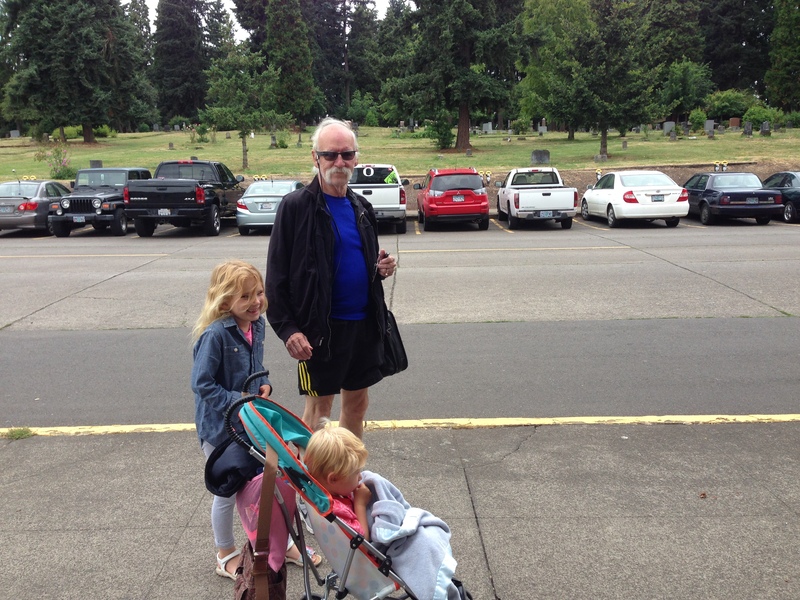 I ran Pre’s Trail, the stomping grounds of one of Eugene’s legends, the great Steve Prefontaine. 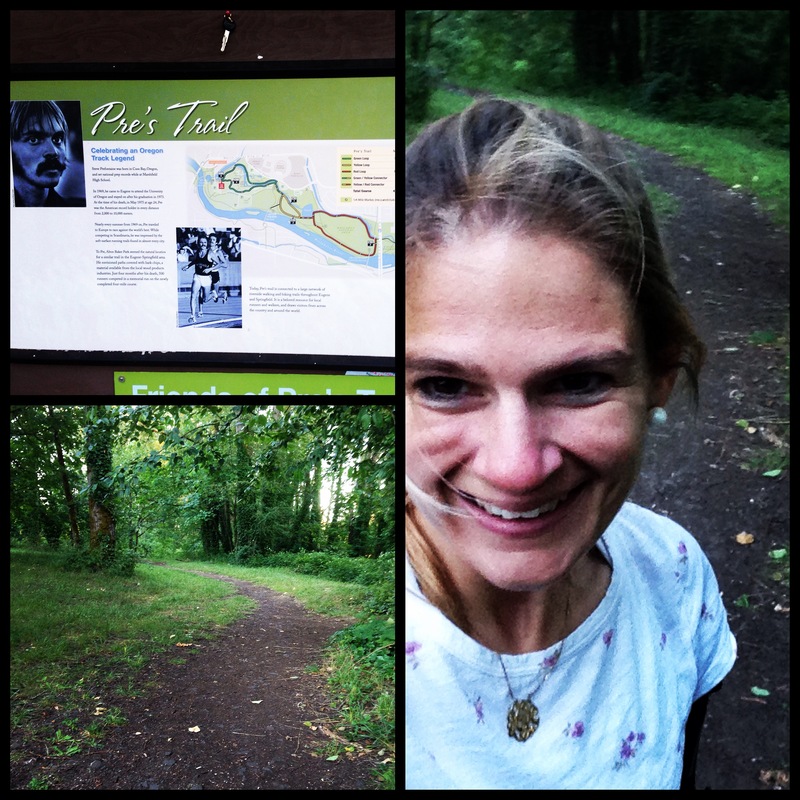 Running Pre’s Trail has been on my wish list of things to do. It was a late run, past 8:00 PM, so I only went a few miles. 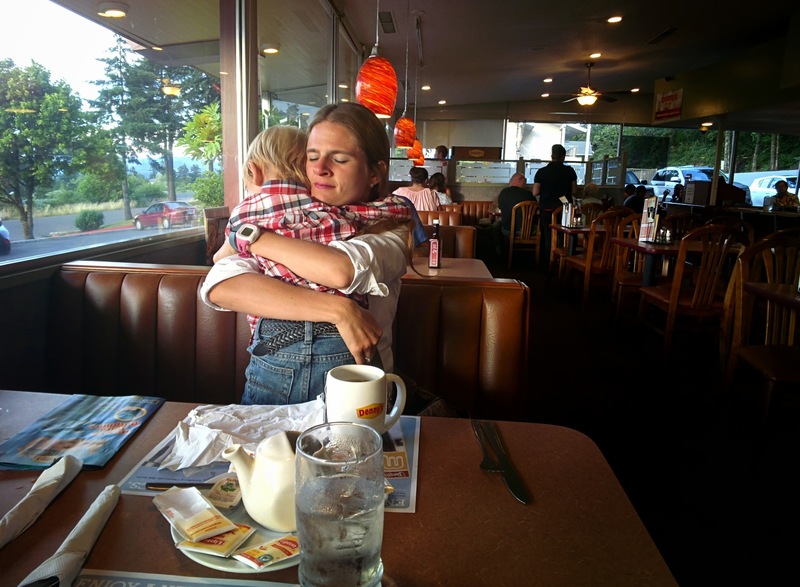 We grabbed a late dinner that night, went to bed, and that was about it, save for the next morning when I got up early to get a longer run in before heading to Portland. 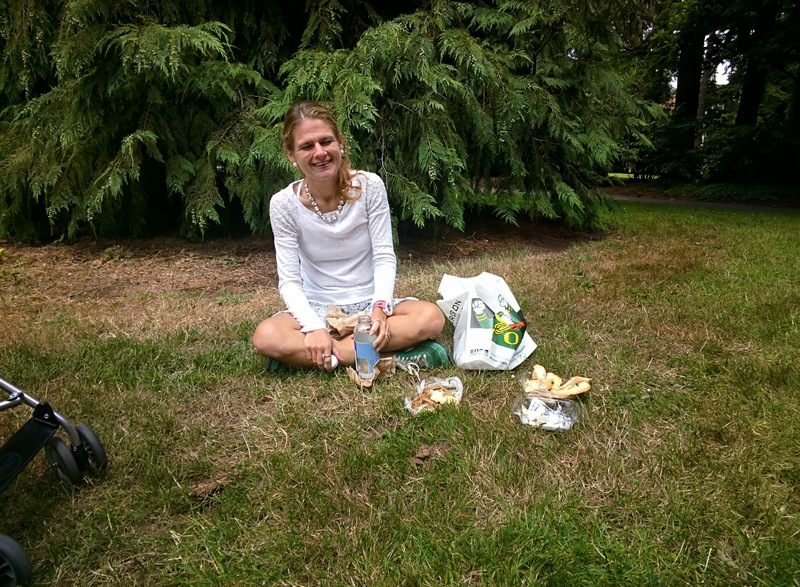 The first time I saw University of Oregon, I ran it. I tried to get onto historic Hayward Field, but those gates had locks tighter than a treasure box. 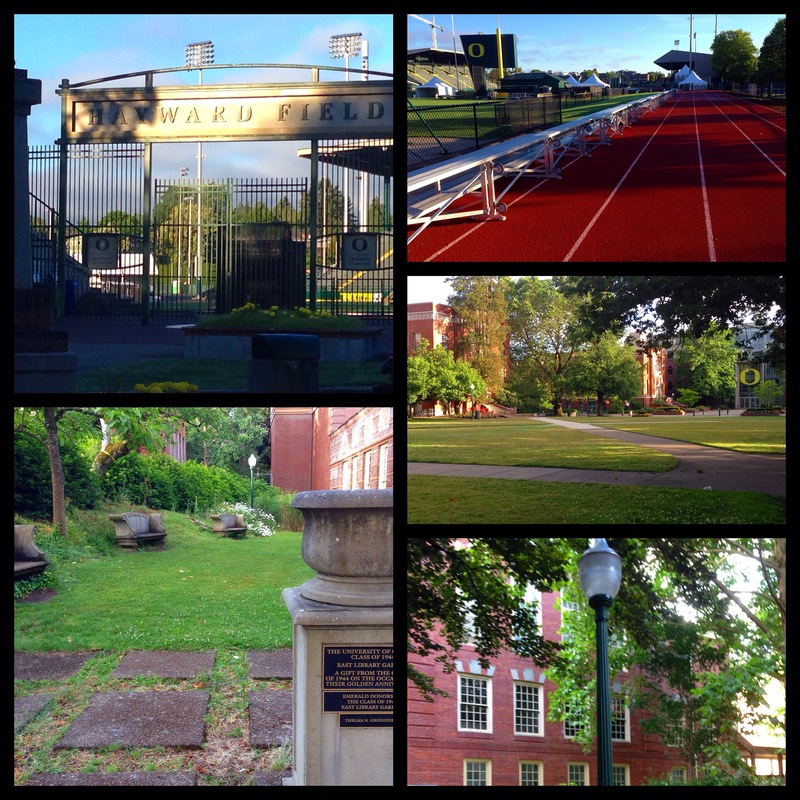 I ran on the intramural track instead and then explored the campus for a little over six miles. That morning, filled with the glorious air and feeling full of the adventure, I remember celebrating with joy my hard-won physical freedom; for this freedom I am never more thankful than at moments like this when my legs can take me all over a new place. Running a place connects body and mind to geography so intimately. 1. The kiddos called out every set of yellow duck feet we passed during our walk around campus. What a nice touch! 2. In the middle of campus grew giant, ancient trees. If I were a student there, I would study under those trees whenever possible. 3. How cozy are all these brick buildings? 4. 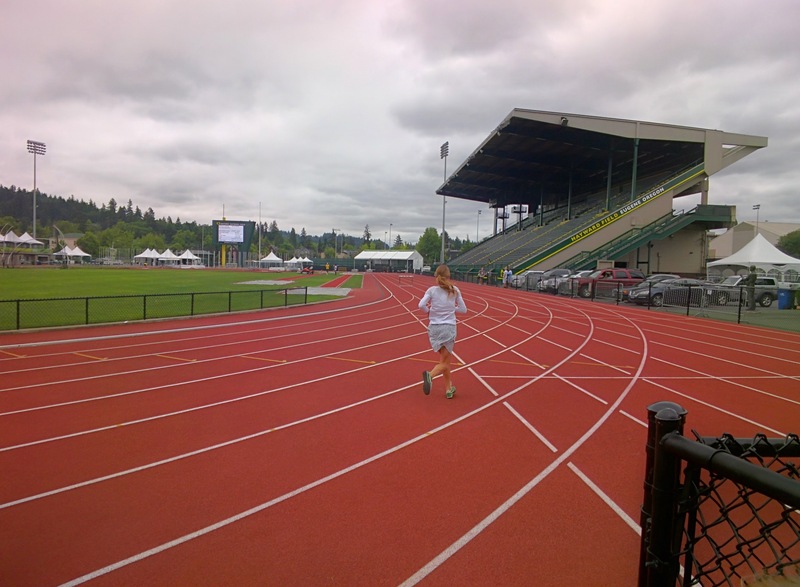 Bill ran a bit on Hayward Field (we eventually did make it on, briefly). 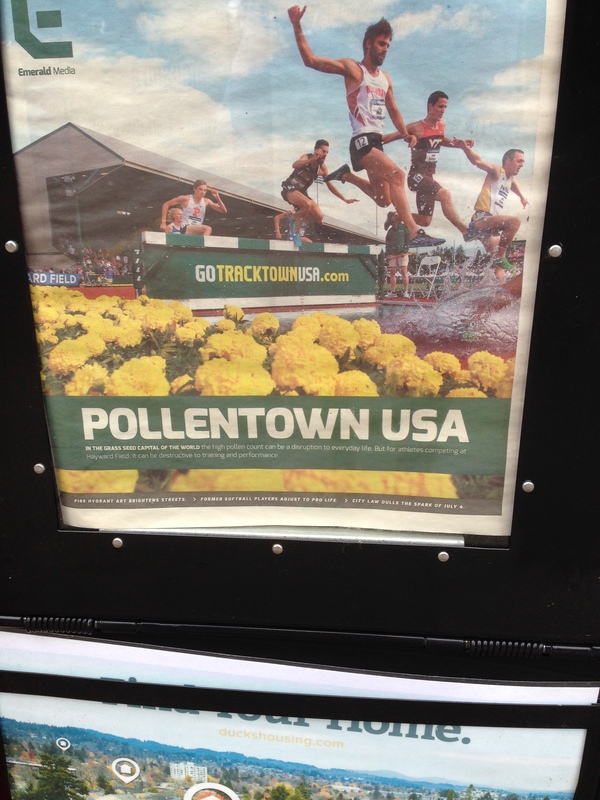 Track town, USA…or Pollentown? We found this paper on campus, and I had to laugh in agreement. Across the street from the Pioneer Cemetery in the middle of campus… Hey, Stanford has the mausoleum, so a cemetery seems normal to me! 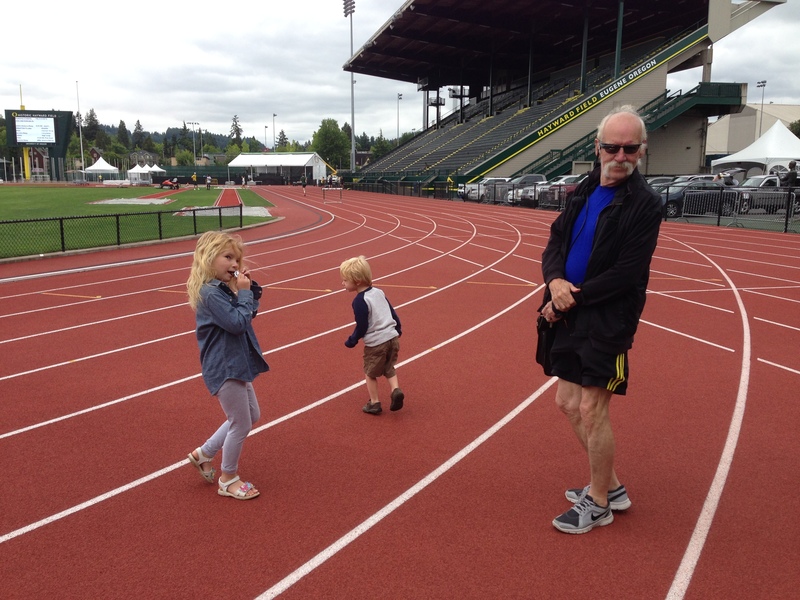 My trio on Hayward Field. Dinner at Glenwood Cafe the night before my 10K race. The Oregon fog tea was delicious! 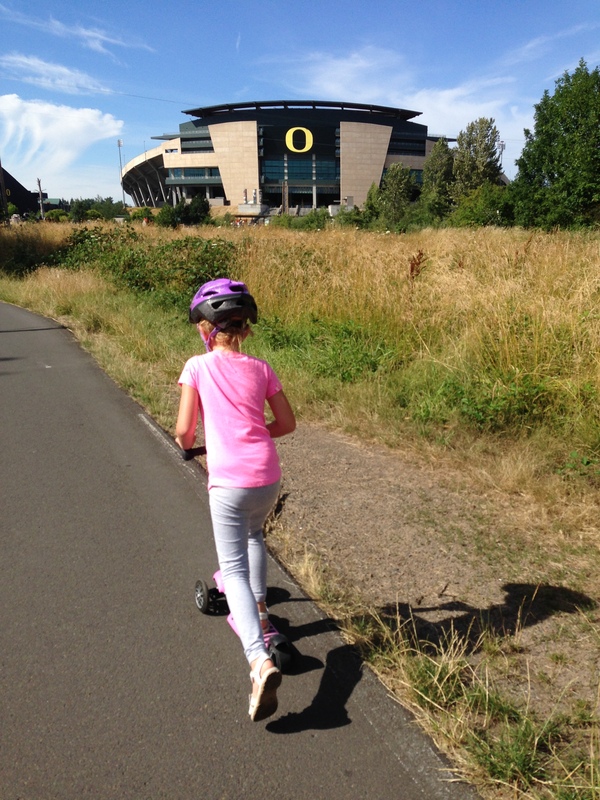 We used our scooters quite a bit in Eugene. 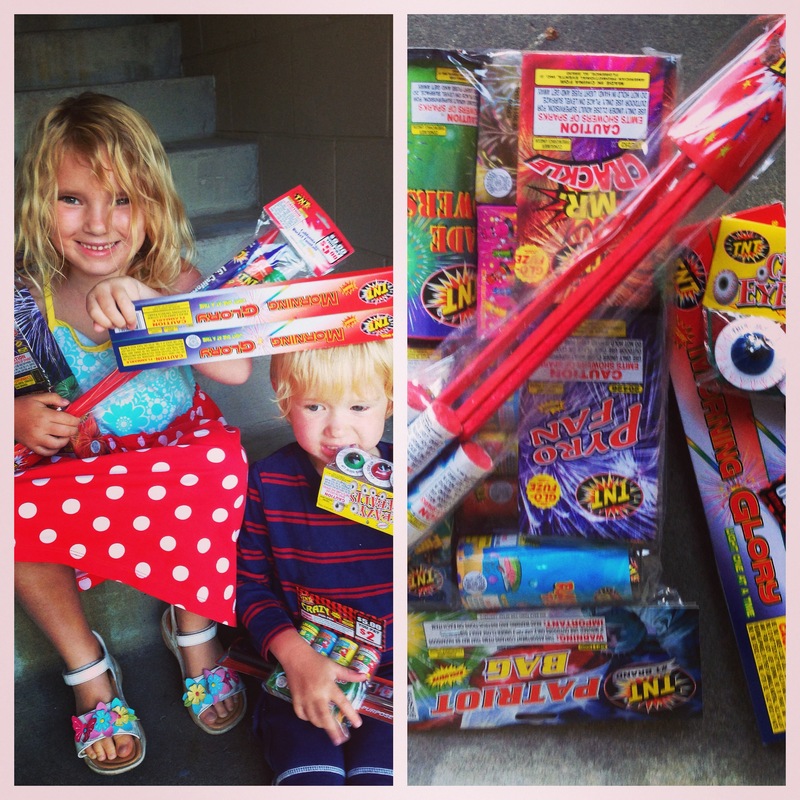 We bought fireworks for the first time ever! So fun! Oregon has a more relaxed attitude toward fireworks than does California. And then the 4th of July happened. 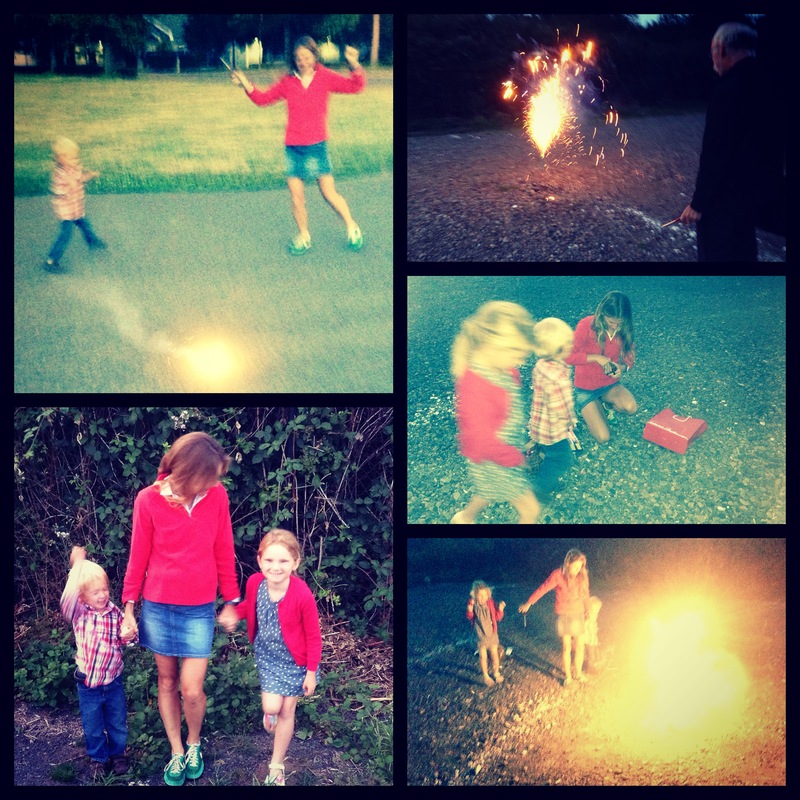 Last year we spent the 4th in Shipshewana, enjoying an ice cream social with kinfolk at a huge Yoder reunion and watching fireworks over farmland from the suite at the inn and marveling at the fireflies. I missed my extended family then, and I missed them this year, too. At the same time, the 4th of July in Eugene has to be one of the best I’ve ever experienced. We began the day with my Butte-to-Butte 10K road race (I have blogged about that race already, and it was a favorite of mine this year). After Butte to Butte, the kiddos and I hiked. Back at the inn, we tried dozing until lunchtime. I knew I wanted to take Katie and Eric on a special picnic, so we dressed in our red, white, and blue and headed toward the local market. We played at Pioneer Park, which has to be one of the most amazingly appointed parks to which we’ve ever been: it had structures for the blacksmith, the general store, the bank, the one-room schoolhouse, and more. 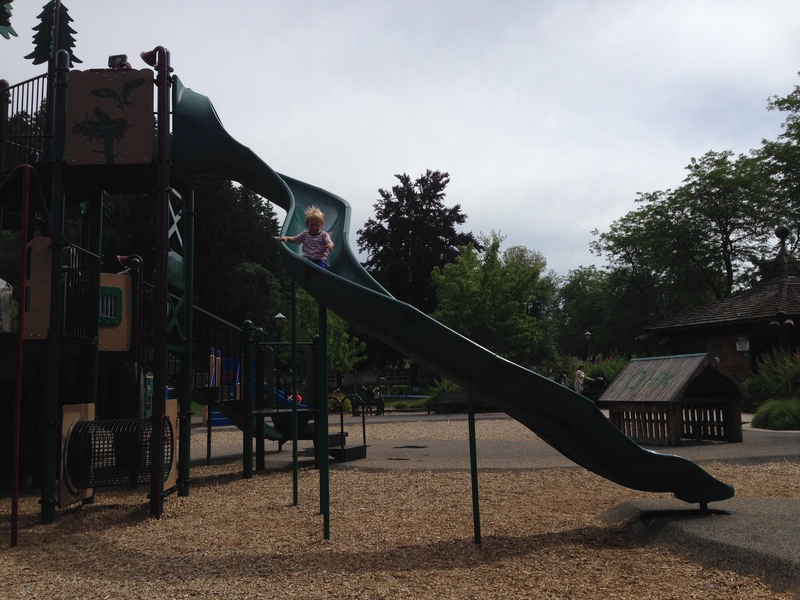 The kiddos had played at that park earlier in the day during my race, and then we played for another several hours in the afternoon. 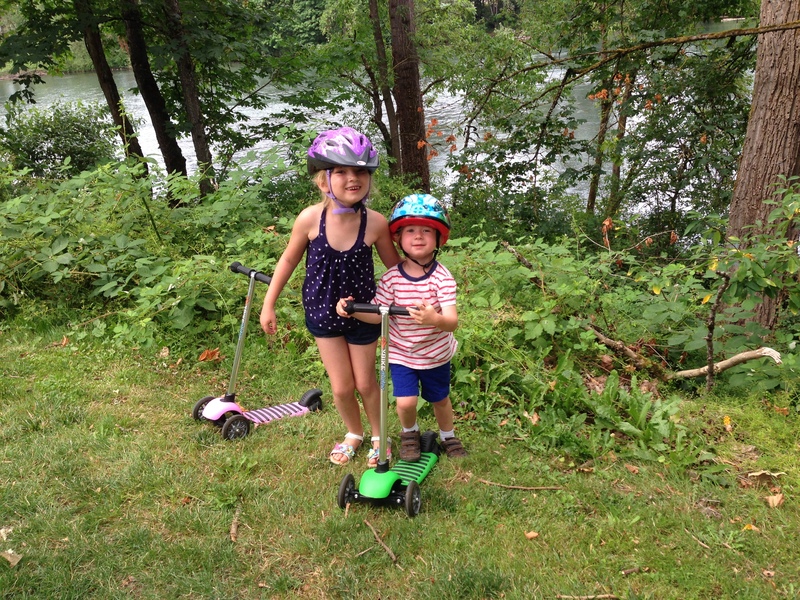 4th of July babies, their scooters, and the Williamette. 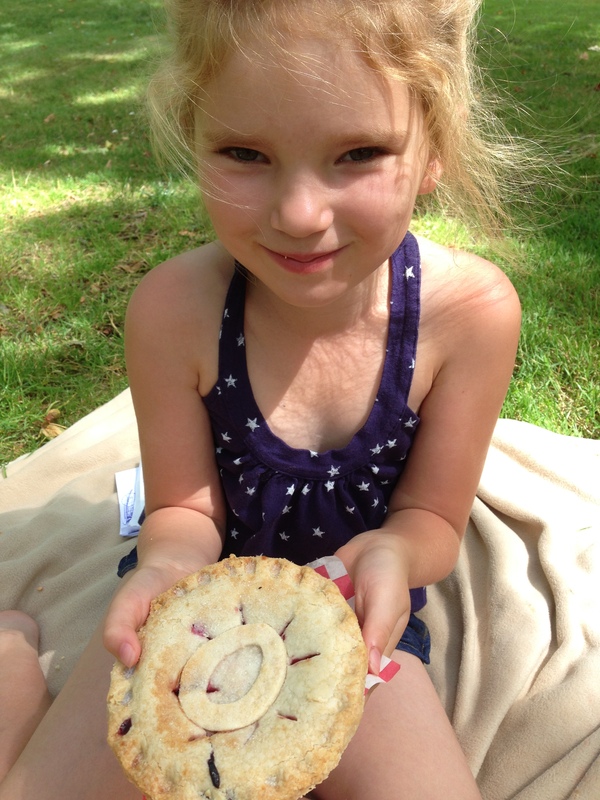 At a local market, we even found a miniature pie, made from Oregon berries, including marionberries. We always have berry pie at my family’s 4th of July party, so this was a way to feel connected to our family tradition. 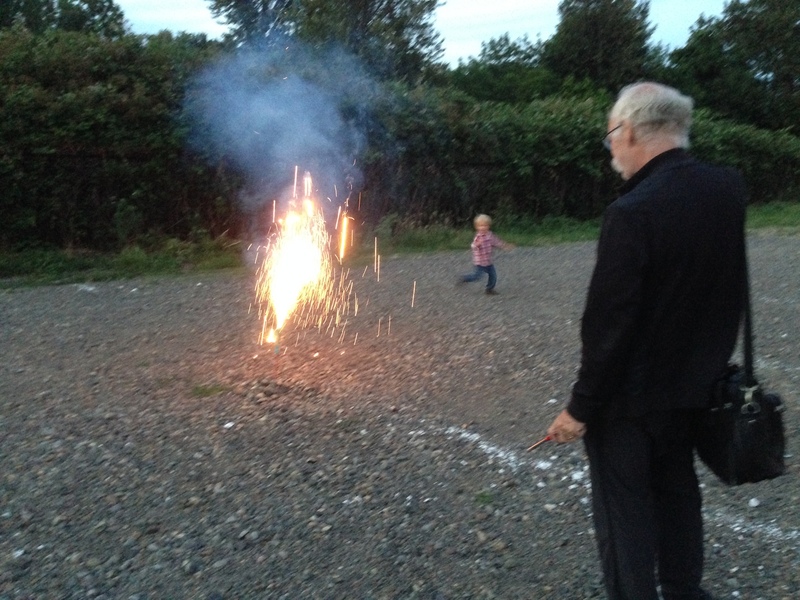 That evening—for the first time in my life, and I am 34—I got to set off fireworks. Splendid. Exhilarating. Even now two weeks later, we’re still talking about the magic of that night. The city itself set off fireworks close to 10:00 PM, and we were able to catch a few of those, as well. We also went to see Pre’s Rock on the 4th, a memorial at the place where he tragically crashed, turned over his car, and subsequently died…not yet even 25-years-old. 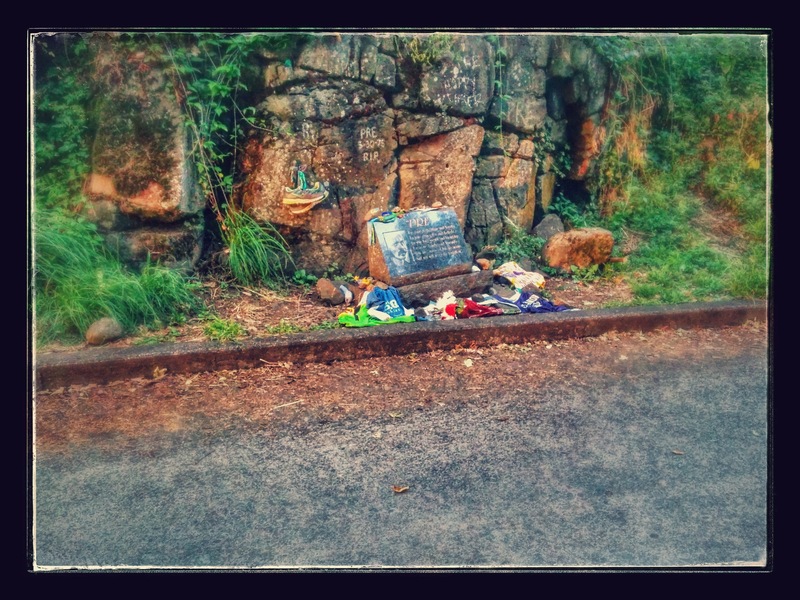 I guess it is a bit morbid to see the place where he died, in a way, yet his legacy is still palpable in Eugene. 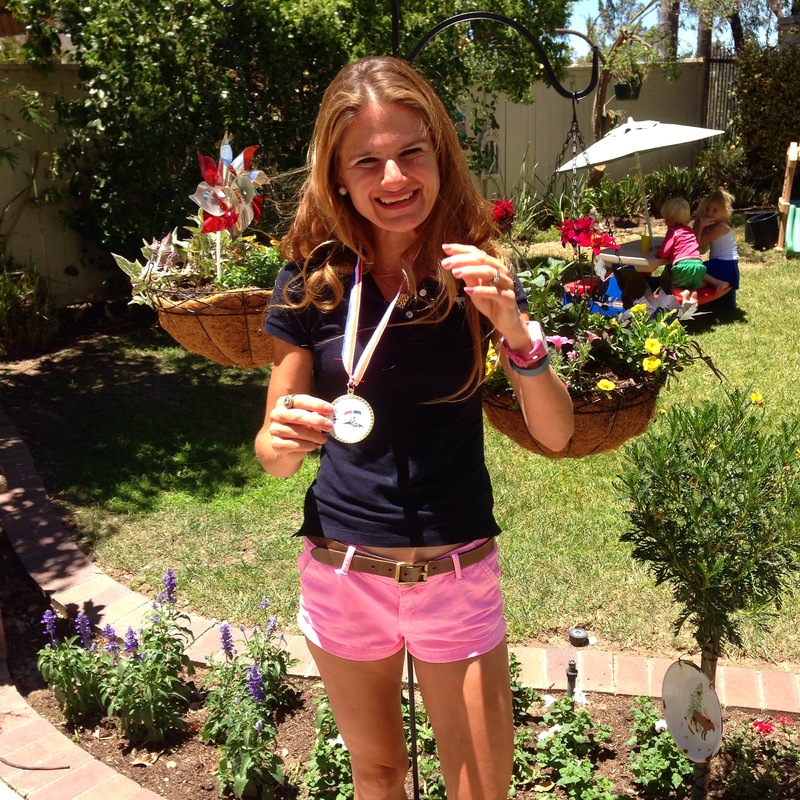 A week later, my medal arrived, a little souvenir from Eugene. There was a snafu involving a 5K participant who crossed right as some of the 10Ks were first crossing, and all of us women 10K finishers got bumped a space down. I really earned 3rd place in my division, once officials straightened it all out. Hence, the medal, my treat from Eugene! Eugene rooted itself deep. I haven’t gone a day since we’ve been home without missing life there. 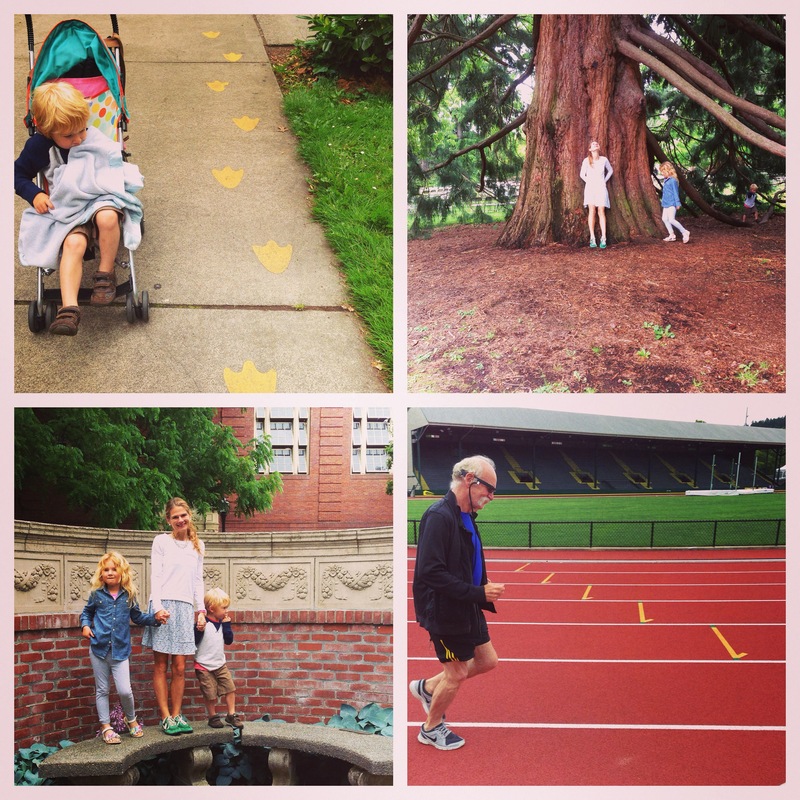 With its track and field history, Eugene is an especially unique and inspiring destination for runners. I haven’t gone a day since we’ve been home without missing life there!